Selective authenticity and the Spanish Empire in computer games. The term empire is extremely popular. It might make people think romantically about the rise and fall of Ancient Rome, nostalgically remember the British rule over the Seas, or stand in awe before the image of legions of stormtroopers crushing the rebel resistance in the name of the Galactic Empire. Although historians and political scientists may disagree with the ambiguous use by mass media of this controversial concept, no one can question its popularity in pop culture products. Videogames, especially those inspired in the past, excel in the indiscriminate use of the word. From the seminal Age of Empires (Ensemble Studios, 1996) to the not so popular Empire: Total War (The Creative Assembly, 2009), developers have used this broadly interpreted historical category to tell interactive tales about marvellous discoveries, epic conquests and mighty rule. Many of these games are set in the Early Modern period, when the first great European expeditions took place and the first transoceanic empires rose, only to fall and be replaced by the expanding pressures of their competing neighbours. Therefore, it is only natural that the representation of the empire upon which the sun never sets is privileged in these products. The phrase, coined during the rule of King Phillip II of Spain, made reference to the rule of the Spanish branch of the House of Habsburg over a vast and complex set of territories that spanned across the globe. The most part of these lands were discovered accidentally when Cristopher Columbus, a sailor commissioned by the Catholic Monarchs, set foot in the Caribbean in 1492. Beyond the Antillean isles where Europeans initially settled laid a vast, unexplored continent that attracted many adventurers form the Iberian Peninsula and the recently conquered Canary Islands. Thus began the historical process known as the Spanish Conquest of the Americas. Such a decisive event, considered one of the most important milestones of the Western culture, has been subject to the scrutiny of the historians since the day it began. It is also very present in the collective memory and the public history, praised by ones and criticized by others. The Conquest is a topic of discussion that never goes old, and thus it is prone to interested interpretations that have blurred reality with myth. Here, we follow the claims of Elliott and Kapell when they say that the version of the past presented by games draws more from myth than from historiography (this is, how historians make meaning of the past). Furthermore, the aforementioned authors state that myth is an endemic element of any form of history, be it popular or academic. This is why they use the term ‘myth-history’, in order to stress that …an ‘ideology in narrative form’ or a story that contains a worldview is largely the purpose of not just myth, but of history as well (Elliott, A. B. R. & Kapell, M. W., 2013: 362). This results in a process where …game designers often integrate, willingly or not, myths and inaccuracies into products that are sold as ‘historically accurate’” (Holdenried, J. D. & Trépanier, N., 2013: 108). Elliott and Kapell make another interesting point when describing how games represent the past. Due to the ludic nature of these products, by which the player’s actions are noticeable in the game world and influence it, games cannot be historically accurate. Their accuracy becomes compromised the moment the user is granted agency to change the past. This is why games can deal only with authenticity. While accuracy is often associated to historical realism, an authentic depiction of history is the one that gets the feeling of the past ‘right’. In other words, one that resonates with the idea of the past audiences have. This ‘realisticness’ (the term Galloway uses to describe those military shooters that attempt to look real) is neither absolute not constructed in arbitrary ways, but follows a number of rules that Salvati and Bullinger (2013) have named ‘selective authenticity’. These are the strategies followed by the developers when they build their ludofictional worlds and consist on the selection of a number of sings from historical texts, images, and popular representations of the period. After that, creators proceed to arrange these signs following particular narrative conventions that can be easily understood and interpreted by audiences. The elements necessitated by the ‘selective authenticity’ differ, depending on the period depicted and the type of game. As an example for their theory, Salvati and Bullinger coined the term ‘Brand WWII’ to describe the three core elements of the strategies followed by first-person shooters set in the Second World War to feel ‘authentic’: follow cinematic conventions, rely on documentary authority, and feature a strong technological fetishism. Obviously, the process followed in the representation of Spain in games set in the Early Modern period is needed of signs different from the ones of the ‘brand’ mentioned above. They also vary depending on the type of historical simulation they are part of. The current study will only focus on a few examples of games ascribed to the broad category of strategy and simulation, which includes Real Time Strategy games (RTS), Turn Based Strategy games (TBS), and 4x games (explore, expand, exploit, and exterminate). Many of these games are ‘conceptual simulations’ of the past that follow a constructionist epistemology of history, and their narratives tend to be ‘open’, often ‘ontological’. This is, they are digital playgrounds where we can actively create our own version of history through a number of tools given by the developer, and therefore change the course of it (Chapman, A., 2016). While not all the games analysed in this section give the amount of freedom to the player that characterise the ‘realist simulations with open-ontological narratives’, they follow the same strategies of authentication regarding the Spanish Conquest of the Americas, which is their top subject. The authentic image of the conquistador featured in strategic simulations is very specific. We can use the conquistador unit included in the critically acclaimed RTS Age of Empires II: The Age of Kings (Ensemble Studios, 1999), as the paradigmatic example. The visual representation of this warrior is symptomatic: a man on horseback, wearing a steel plate and a characteristic steel helmet, and armed with a musket. Although other games do not offer the emblematic condensation of most of the myths of the Spanish conquest in a single unit as AoE II does, they still offer a recurring image of these European invaders. For example, the 4x franchise Sid Meier’s: Civilization (Firaxis Games, 2001-2016) transmits a homogeneous view of the conquistador despite the changes introduced to the unit by every new instalment. It appeared first in Sid Meier’s Civilization III and was visually represented as a steel-clad horseman armed with a lance and followed by a war dog. The next game in the series almost did not change this portrayal, discarding just the dog. Additionally, the release of Civilization V brought no changes to the established practice. Finally, the recent Civilization VI got rid of the horse and gave conquistadores gunpowder weapons, turning them in a more powerful version of the musketeer unit. Despite the noteworthy changes, the Spaniard adventurer’s martial uniqueness is linked either to the warhorse or to the firearm. Finally, the last example of this trope comes from Medieval II: Total War (The Creative Assembly, 2006). The game displays two types of conquistadores: those unmounted and those who fight on horseback. Despite stepping off the tradition of the harquebuses by arming these men with steel swords and shields or lances, the warriors still wear steel cuirasses and helmets. These visual representations of the agents of the Conquest are highly problematic. Firstly, the conquistador is commonly shown as a mid-aged white male displaying an outstanding beard. This representation is an easy one because it merges two traditions encouraged by the videogame medium: while it privileges a mythical perception of the conquistador, it also reinforces the image of the traditional videogame hero. Furthermore, this partiality resonates with the historiography’s regrettable tradition of focusing on a version of history that privileges the agency of the European male while undermining the role of other human groups. Although this is an archetypical image, these adventurers were few in comparison with other groups and definitively could not achieve the Conquest alone. Among the forgotten groups we can find women, black African and Indians. Regarding the former, the chronicles tell about the deeds of female conquerors that either travelled to the New World following their husbands or crossed the Ocean by their own initiative seeking fortune or just to escape from the suffocating social roles of the Old World. Both played an active and crucial role in que invasion of America, not only by caring about their male counterparts but also fighting Natives and rival Europeans. The most astonishing example is Catalina de Erauso, a woman who dressed as a man and spent years fighting by the side of her male comrades and having sexual encounters with female lovers. Furthermore, this white male-centred representation actively excludes the importance of black Africans and allied Natives in the Conquest, without whom only a few Europeans could have not defeated the vast armies the Indian peoples deployed before them. When we consider the advantages that Spaniards derived from horses, steel weapons, and armor against foot soldiers without metal, it should no longer surprise us that Spaniards consistently won battles against enormous odds (Diamond, J., 1998: 77). This belief is broadly spread among game developers, and presents a narrative that dates back to a time when the Conquest was taking place. The men involved in it wrote texts explaining how, with the help of God, they could have been victorious before so many pagan enemies. These narratives follow the fashion of the chivalric romance and add a huge amount of religious providence to the mix. However, the particular advantages brought by the steel plate and helmet and the harquebuses are not highlighted in these testimonies. Where does its spread use in videogames come from, then? We can find the answer in latter pictorial representations commissioned by the conquistadores and their heirs, and also in the master narratives that explain world dominance in terms of technological development. On the one hand, the portraits and folding screens depicting the period, commissioned from the 17th century onwards, represented the Spanish invaders wearing full armor and helmets, and usually fall in anachronisms. In truth, steel protection became a disadvantage in the climates and landscapes of America and most conquistadores simply wore leather doublets and hats or adopted the type of protection used by Indians, for example the Aztec cotton vest known as ichcahuipilli. In the case of handguns and cannons, very few were deployed during the Conquest. Additionally, their small numbers entailed a low performance, plus they were difficult to use in the humid battlegrounds of South and Central America. Contrary to the steel sword, which became the decisive weapon since it could easily cut through the light armor Native warriors wore. Furthermore, the initial advantage the use horses brought was rapidly contested by the techniques developed by the Indians to dismount Spaniards and reduce the performance of their horsemen. However, in computer games the representation of the musket and the warhorse is privileged while the steel sword becomes a common weapon to almost every faction. Going back to the chivalric records written by those educated conquistadores, we can see that religion played a crucial role in the explanation of their success. These narratives gave God a prominent role, presenting Spaniards as mere tools of His will. The conquerors also claimed that they were aided in battle by divine forces, manifested in the figure of the Virgin Mary or, more frequently, in the form of Santiago, patron saint of Spain. According to the Christian discourse, the warrior saint had actively helped the Christian kingdoms of the Iberian Peninsula defeat their Muslim counterparts during the Reconquista. Due to the interpretation of the Conquest of the Americas as an extension of the Crusade against infidels and pagans, it is only natural that conquistadores justified their actions with religious explanations. This produced a circular and self-reinforcing discourse by which the victories of Spaniards against their Pagan foes became inevitable due to God’s will, while these victories justified that God was by their side. In computer games we can see the example of AoE II’s conquistador, who yells “Santiago!” when ordered to attack an enemy unit. However, a more remarkable ludic representation of this idea is the one featured in Sid Meier’s: Civilization VI (Firaxis Games, 2016). This game’s conquistador benefits from a strength bonus against enemy forces following a different religion than his. 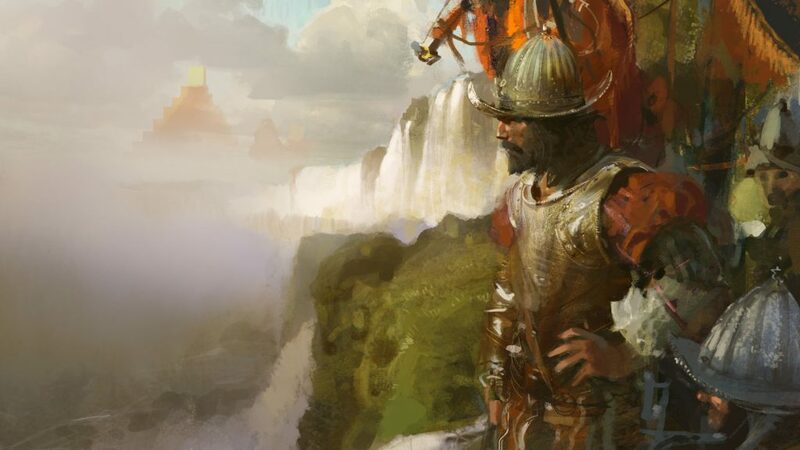 Furthermore, when close to a friendly religious unit (a missionary or an inquisitor, for example) this strength bonus is reinforced, making the conquistador a fearful enemy for those players who do not worship the same God. 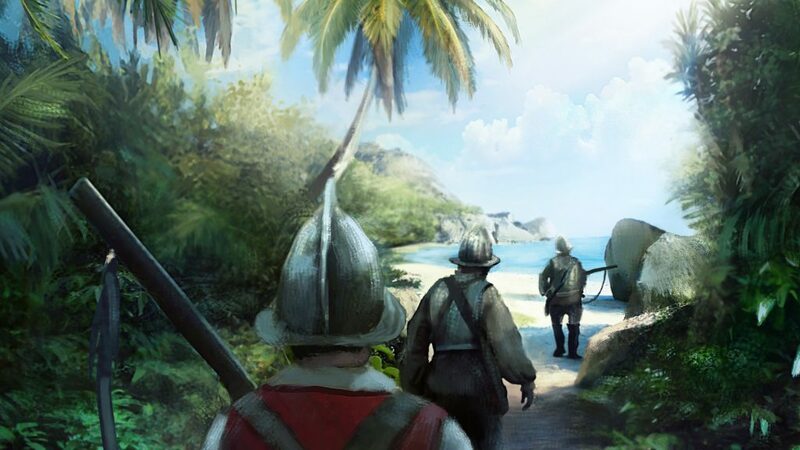 The present study is limited to visual representation of the characters and units associated to the Spanish Empire in games addressing Early Modern empires. We have left outside the analysis those games included in the broad genre of action and adventure, since the nature of their ludonarrative necessitates from different strategies of selective authenticity. These products, gathered under the term ‘conceptual simulations with deterministic narratives’ by Chapman (2016), privilege less symbolic representations and are very influenced by cinematic narrative traditions. However, for an analysis of strategy and management games to be complete, one has to pay attention to how unique rules regarding Spain merge with the overall system of rules that govern the game. The ‘procedural rhetoric’ (Bogost, I. 2007) emergent from these interactions, this is, the discourses produced by the tension between the player’s agency and the game’s mechanics, make the strongest claims about the past. Although the audiovisual content referential to history is key to understand how game developers perceive certain parcels of the past, it is in the ludonarrative where creator’s claims achieve their full potential (Chapman, 2014). A good example of the latter is Holdenried and Trépanier’s (2013) piece included in Playing with the Past. It focuses on how the system of rules of two wargames adapt the different concepts of dominance between Spaniards and Aztecs during the conquest of the latter’s empire. While Age of Empires II: The Conquerors turns to traditional and often outdated explanations based on the fragility of Montezuma’s Triple Alliance and the Spaniard’s superior warfare technology, Medieval II: Total War makes an interesting point by putting Aztec chieftains at the centre of their army’s moral system and also allowing the Spanish faction to recruit Native allies. Finally, we want to end the present study highlighting a historical element missing in most of the digital simulations of the past: disease. Triple A games with historical settings tend to forget that epidemics played a crucial role in historical processes in general, and in the Conquest of the Americas in particular. A study of the ideologically parcelled representation of the indigenous people of the Americas in computer games has shown that the ravages of diseases such as smallpox, malaria and typhus (to cite a few examples) are nowhere to be found (Mir, R. & Owens, T., 2013). In the case of the Spanish Conquest, Pizarro and his warband reached the Inca Empire shortly after the end of a civil war that confronted two contenders to the throne after the smallpox killed its legitimate heirs. Developers argue that the inclusion of these factors would dramatically affect gameplay by reducing player agency, and therefore they consider wiser to leave epidemics out of the picture. However, we can find successful and clever examples of playful creations that put the disease at the core of their ludonarrative: Plague Inc. (Ndemic Creations, 2012) and Pathologic (Ice-Pick Lodge, 2006) are just two of them. Although its randomness could make epidemics a difficult variable to implement, the aforementioned examples demonstrate that it is not impossible to do. Furthermore, what the historian-developer’s unwillingness tells us is that digital simulations of the past still draw from historical explanations dating from the 19th century. This is, they focus on the tale of great men and great nations that prove their right to rule by defeating their enemies through the use of violence (Venegas Ramos, A., 2016). However, nowadays the video game medium is mature enough to write the history of Humanity, and the Spanish Conquista in particular, by leaving the myth of the mounted musketeer back in the Iberian Peninsula. Bogost, I. Persuasive Games: The Expressive Power of Videogames. MIT Press. Cambridge (Mass. ), 2007. Chapman, A. Digital Games as History. How Videogames Represent the Past and Offer Access to Historical Practice. Routledge. Oxon, 2016. Chapman, A. “Privileging Form over Content: Analysing Historical Videogames”, en Journal of Digital Humanities, volumen 1, número 2, 2012. Diamond, J. Guns, Germs and Steel: the fates of human societies. W. W. Norton. New York, 1998. Elliott, A. B. R. & Kapell, M. W. Playing with the Past. Digital games and the simulation of history. Bloomsbury. London/New York, 2013. Galloway, A. “Social Realism in Gaming”, en Game Studies: the international journal of computer game research, volumen 4, número 1, 2004. Holdenried, J. D. & Trépanier, N. “Dominance and the Aztec Empire: Representations in Age of Empires II and Medieval II: Total War”, en Elliott, A. B. R. & Kapell, M. W. Playing with the Past. Digital games and the simulation of history. Bloomsbury. London/New York, 2013, pp. 107-120. Mir, R. & Owens, T. “Modeling Indigenous Peoples: Unpacking Ideology in Sid Meier’s Colonization”, en Elliott, A. B. R. & Kapell, M. W. Playing with the Past. Digital games and the simulation of history. Bloomsbury. London/New York, 2013, pp. 91-106. Restall, M. Los siete mitos de la conquista española. Paidós. Barcelona/Buenos Aires/México, 2004. Restall, M. Los conquistadores: una breve introducción. Alianza editorial. Madrid, 2013. Salvati, A. J. & Bullinger, J. M. “Selective Authenticity and the Playable Past”, en Elliott, A. B. R. & Kapell, M. W. Playing with the Past. Digital games and the simulation of history. Bloomsbury. London/New York, 2013, pp. 153-168. Venegas Ramos, A. “La Historia de los Videojuegos y el Papel del Historiador”, en Deus Ex Machina: Cuaderno de máquinas y juegos, número 0, 2016, pp. 226-231. Age of Empires II: The Age of Kings (Ensemble Studios), 2000. Medieval II: Total War (The Creative Assembly), 2006. Sid Meier’s: Civilization (Firaxis Games), 2001-2016. Interview with Emre Deniz, director of Opaque Space.